For over 40 years, Gerhardt Steidl has been creating and publishing some of the highest quality books available on the marketplace. In fact, the publications his company crafts are far more than mere books; they are beautiful, meticulously handcrafted works of art. Steidl's commitment to quality and his industry-leading process of creation are the subjects of How to Make a Book with Steidl, from directors Gereon Wetzel and Jorg Adolph. Rather than exploring Steidl's personal life or history as a publisher and printer, the film takes a fascinating backseat observational approach, following Steidl through his daily motions. This ranges from overseeing the in-house printing press to hopping on a plane to meet with clients throughout the world. These customers include painters and photographers Ed Ruscha, Robert Frank, Jeff Wall and William Eggleston, as well as renowned Chanel designer Karl Lagerfeld. It's through these insightful glimpses into Steidl's life that we quickly realize the key to his success has been the dedication to his craft. Publishing isn't a job; rather, it's who he is. Instead of simply churning out books ad nauseam — much like the world's biggest publishing firms — he handpicks his clientele, which finds him working with artists instead of authors. This makes Steidl part of the creative process, often influencing how an artist's work is presented in the finished product. Of all the projects we witness in various stages of production, How to Make focuses its attention on one particular effort: iDubai, from photographer Joel Sternfeld. This book contains a collection of (possibly ironic) photographs taken by Sternfeld with his iPhone while travelling in Dubai. It also acts as a metaphor for the steady decline of the print publishing industry as the digital world continues to encroach upon its territory. Through iDubai's various stages of production, viewers are provided with tangible evidence that print publications offer a unique viewing experience the digital world simply cannot match. Much like a bottle of fine wine, Steidl's books are about the overall sensory experience, such as the feel and smell of the paper, as well as the the sound the pages make as each one is turned. 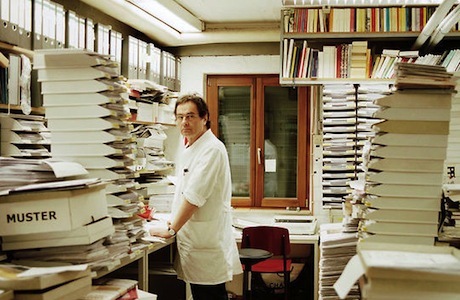 The scent of his books is addressed several times throughout the film, with Steidl frequently pointing out that the key to a good book is its smell. Modern publishers use a special wash system to eliminate the smell from their books, but Steidl remains steadfast that the scents of paper and ink are vital components to a reader's experience. Wetzel and Adolph do an excellent job of documenting without interfering, staying at arm's length from their subject while managing to be in the thick of things. They haven't invented the wheel with their film, but you can't help but feel as though you're witnessing something special.